I am researching Parkfield House Ladies College that was at 8/9 Rutland Villas, Perry Vale in the 1870s-80s. In the 1891 census it is renumbered 70-72 Perry Vale and is now occupied by Edwin Milner, furnishers. In 1911 it is home to Herbert Henry Stubbs, coloured cleaners for suede boots. It then becomes Parkfield Garage, motorcycle engineers, makers of PV Motorbikes. Perry Vale machines are still being ridden by enthusiasts! Fantastic looking bikes. In the 1920s it seems to then become a motor car garage and an Omnibus company- Enterprise Transport Co. Ltd with 5 double decker vehicles. This is compulsory puchased in 1936 when London Transport absorbed all the private companies. I am not sure of the history of this address after that, but at some time during the war it was severely damaged and later demolished. My hope is to find photos/ info of this address. My best hope, I guess would be in that period when it was a motor cycle manufacturers/ omnibus operators. If you google it it appears to be Christchurch School- I think this was a bombsite and the school rebuilt? However the first of the two houses just beyond this used to be some kind of works yard before another house was built on it. Its odd as the even numbers were generally on the other side of the road- I used to live in a house further down. Try contacting someone called Steve Grindlay who posts here and on the Sydenham Society websites. Parkfield College for Ladies, Parkfield House, Perry Vale closed in 1886/7. I am researching the proprietress, Mary Anne Strickland, her students and staff. Adverts declare "european governesses and eminent professors.....two acres of pleasure grounds"
She returned to her home town of York, having sold the school. In 1889 she returned to London and took on an already existing school at a house in Tuffnell Park, near Highgate. We live in that house. My hope is to find photos or info on the Perry Vale school. It was located on the west side of Perry Vale, and was the last building before the junction with Dacres Road. So I don't think it can be Christchurch School. There was a convent in Dacres Road many years ago. Perhaps there was some connection. I suggest you try Lewisham Council's archivists. they may be able to help. This now sounds like Vale Lodge, a private block of flats on the northern corner of Perry Vale and Dacres Road junction. It was built around 1936. I used to live there- I dont know if I have a copy of the lease any more but I would hedge a bet thats your site however it was built pre war so doesnt fit your demolition thesis. On the other side is Valentine Court which I think was built inter war. So if its not Vale Lodge I don't know what it could be as Perystreete is also interwar. Interesting stuff all this! If you include the Vale Lodge building, and include the allotment area, the rear garages, and Ian Court next door you are probably looking at a 2 acre site at least. I cant think of anywhere else that would fit the bill. Actually I go back on everything I've just said. 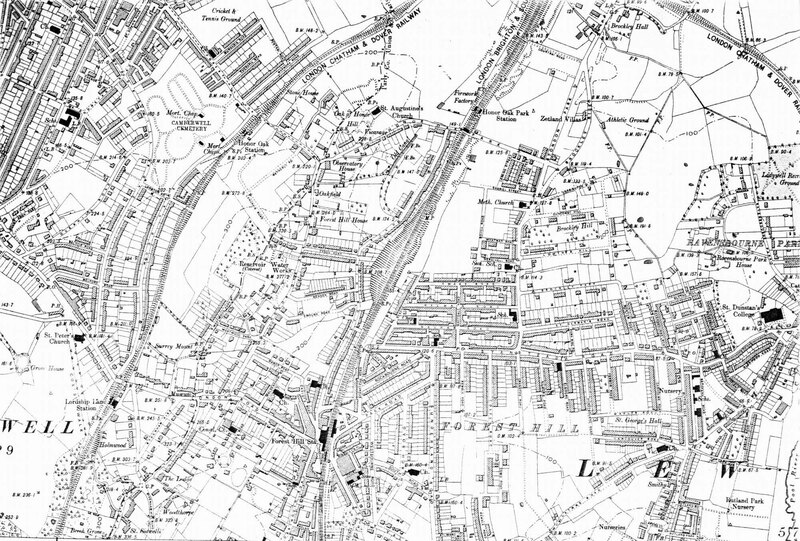 The attached 1890s map shows the current site of Vale Lodge as a wooded area so that no longer looks likely. If you look south of Dacres Road there are what appear to be some detached houses which I dont think are there any more so the site of these are a possibility. I believe that Christchurch school is a former bomb site so it would perhaps fit that these houses also took a hit and were demolished. I have attached a bomb damage map which hopefully makes it a little clearer. Why didn't I do that to begin with? Silly me. Roz, your thoughts on the acreage might be spot on. It may of been part woodland, but wouldn't the school talk it up a bit? The site of Vale Lodge (if I'm on the right track) would have fallen in these "pleasure grounds". The bomb map is colour coded with purple and black being the most severe. Direct hits are shown as circles. Go to the bottom left bomb circle. Just outside at the 2 o'clock position is the end of a straight row of terraced houses on the west side of Perry Vale. The last two I believe were 70-72 Perry Vale. They are quite badly damaged. In the rear of these last two houses is an area colour coded orange. A strange structure to have in the rear of two gardens! Surely this was the Motor Cycle workshop and then the omnibus garage. There was probably, looking at the map, just enough room for vehicles to access either down the side or at the rear of the terrace. Note also that Vale Lodge, though quite near a direct hit, is colour coded as repairable. My search for images of these premises goes on. Perhaps local papers may have done a feature on the motorbike works. All info welcome. ps to get the map under the 500 kb allowed I have had to delete a bit of it, hence the white square. Apologies, I must be totally blind !!!! Clearly I didn't read you message properly as I would of seen your attached map You even said it was attached!. Sorry about that-so a belated thanks. Was the bomb map of any interest. Clearly something has changed at the rear of the two houses. I will give any updates on any new info. I haven't yet researched engineering reports (sewers/drainage etc) that often include a detailed street plans. Also land tax records. Just seen this thread. Regarding the bomb damage maps, the rings on this map are V1 bombs. Buildings shown damaged outside these rings would have been hit by bombs from aircraft. Yes I realised a short while after posting it that I got that detail wrong. Not too significant, I guess. I've started a new thread (is this the right term) updating everyone re: Parkfield House, Perry Vale and some interesting info regarding it's history and owners.